"Christopher Wanjek uses a take-no-prisoners approach in debunkingthe outrageous nonsense being heaped on a gullible public in thename of science and medicine. Wanjek writes with clarity, humor,and humanity, and simultaneously informs and entertains." Prehistoric humans believed cedar ashes and incantations could curea head injury. Ancient Egyptians believed the heart was the centerof thought, the liver produced blood, and the brain cooled thebody. The ancient Greek physician Hippocrates was a big fan ofbloodletting. Today, we are still plagued by countless medicalmyths and misconceptions. 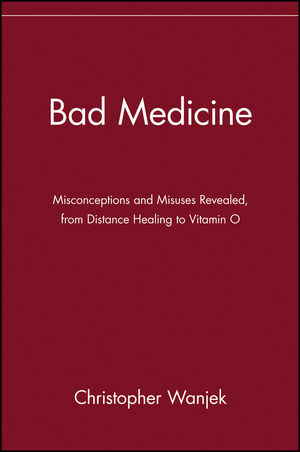 Bad Medicine sets the record straight bydebunking widely held yet incorrect notions of how the body works,from cold cures to vaccination fears. * You only use 10% of your brain: CAT, PET, and MRI scans all provethat there are no inactive regions of the brain . . . not evenduring sleep. * Sitting too close to the TV causes nearsightedness: Your motherwas wrong. Most likely, an already nearsighted child sits close tosee better. * Eating junk food will make your face break out: Acne is caused bydead skin cells, hormones, and bacteria, not from a pizza witheverything on it. * If you don't dress warmly, you'll catch a cold: Cold viruses arethe true and only cause of colds. Protect yourself and the ones you love from bad medicine-the brainyou save may be your own. CHRISTOPHER WANJEK is a frequent contributor to the Washington Post; he has also written for Smithsonian and Forbes, among other publications. He writes jokes for The Tonight Show and Saturday Night Live. Wanjek is also a senior writer for NASA. He has previously worked as an in-house science writer at MIT and the NIH. Introduction: The Roots of Bad Medicine. PART I: I SING THE BODY ECLECTIC. 10 Percent Misconception, 90 Percent Misdirection: The Brain atWork. Big Brain, Little Smarts: Brain Size and Intelligence. Blinded by Lies: The Eyes Have It. All in Good Taste: How the Tongue Works. Scrubbing Your Liver: The Demystification of Detoxification. Refer to the Appendix: Useless Organ or Helpful Player? Going Gray? Not Today: White Hair and Its Causes. The Race Is Off: Race Defined. Losing One's Mind: Memory Loss and Aging. Getting Stiffed: Vitality and Aging. Illness Gets Old: Aging and Disease. See You in 2150: The Long and Short of Life Span. On and On: Longevity and Genetics. PART III: ENOUGH TO MAKE YOU SICK. The Plague Lives! The Black Plague in the Modern Age. Cold Comfort: How to Catch a Cold. The Ill-Advised War on Bacteria: Are All Bacteria Bad? Radiating Misperception: Radiation, Pro and Con. Swimming with Sharks: Sharks and Cancer. Mutating Misconceptions: What Your Genes Say about Your FutureHealth. PART IV: EATING IT UP. Learning Your Alpha-Beta-Carotenes: Antioxidants, Pro andCon. The Unbearable Heaviness of Being: Fat People and Food. Not Milk? Milk and Your Health. Organic Reasoning: The Benefits of Organic Food. Water, Water Everywhere: Bottled Water vs. Tap Water. The Whole Grain Truth: Are Whole Grains Healthier? PART V: THE RETURN OF THE WITCH DOCTOR. The Delusion of Dilution: Homeopathy X 50. Magnetic Charm: Magnets and Your Health. Reversal of Fortune: The Viability of Ayurveda. Something Smells Funny: Aromatherapy As a Cure. Suffocating Trends: Oxygen--How Much Is Too Much? The Ultimate Hands-Off Approach: Touch Therapy, Qigong, and FalunGong. Getting to the Root of the Problem: Herbs As AlternativeMedicine. A Shot in the Arm: The True Dangers of Vaccines. PART VI: RISKING IT ALL. Toxic Avenger: The Science of Toxicity. Peer-Reviewed for Your Pleasure: How Health Studies Work. Candy Adds Years to Your Life: And Other Important Health StudyFindings. We're #1: Rating America's Health. PART VII: JUST LIKE IN THE MOVIES. I'm Not a Reporter, but I Play One on TV: The Accuracy ofTelevision Medical News. Rambo VI: The Quest for Hearing: Guns and Their Aftereffects. Knocked Out, Loaded: Imagined Violence and Real Problems. Epilogue: Tomorrow's Promise: Bad Medicine on the Horizon.